The man who wrote the book on Mr. Sunshine comes to the Old Monk to talk about his origins in Dallas. The first game of the final season in Globe Life Park didn’t go so well for your Texas Rangers. But the excitement of the season was palpable, however unlikely success is for Arlington’s finest. Opening Day coincided with a fairly grueling schedule for author Ron Rapoport, a Detroit and Chicago sportswriter who’s since decamped to Los Angeles. At least, for him, the Cubs got the win. He was in town to promote Let’s Play Two: The Legend of Mr. Cub, The Life of Ernie Banks. The Amazon link is right here. You probably now know that Chicago legend Ernie Banks was born in Dallas. But until last year, the city had not honored one of its most famous native sons. Now a bronze statue of Banks stands outside Booker T. Washington High School for the Performing and Visual Arts, in the same area where Banks once played football. Rapoport spent a lot of time in Dallas for his book, and the city occupies four whole chapters. “I believe you can’t understand Ernie … if you don’t understand where he came from, and much of that was in Dallas,” Rapoport told us. Rapoport on the podcast told us a lot about Ernie Banks. But he also told us about Dallas, about how the Arts District was a stretch of shotgun homes, about how Booker T. was one of two black high schools at the time. Ernie, in fact, lived where the Wylie Theatre stands now, in a neighborhood that had no outdoor plumbing. 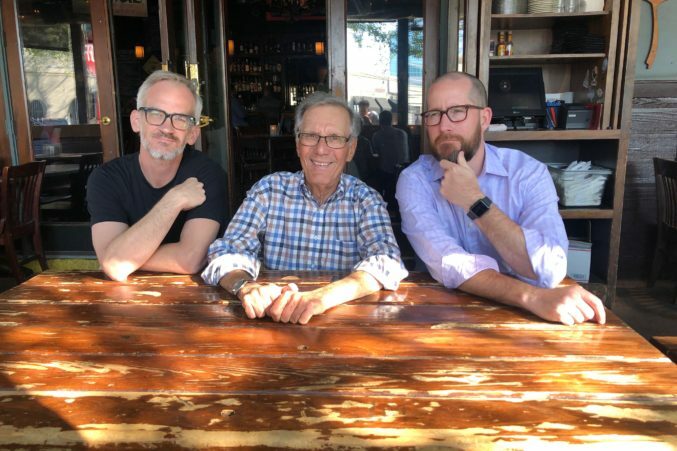 So read this excerpt of Rapoport’s book, read about Ernie’s statue, and then listen to this podcast to learn a little bit more about your city. It’s after the jump. Ron Rapoport, flanked by Zac and Tim.